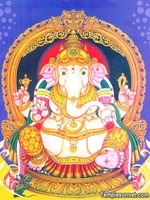 This year Vinayaka Chaturthy falls on 17th September. On the eve of this auspicious occasion, let us spare some thoughts for Vinayaka. Lord Vinayaka has got His name from the belief that he removes Vinai or Karma or the consequences arising out of our past action. The modern generation describes him as Win Nayaka, the Hero who always wins and brings success to his devotees. Lord Ganesha has a distinct identity of his own. With his elephant-headed face, a large belly and four arms, he can be easily spotted. One finds a Ganesha temple in any human habitat. Lord Ganesha is the God most worshipped, most venerated and most sought after because he is known as the Remover of all Obstacles (Vigneswara). He is also known by many other names which denote his character and nature like Jnana Ganapati (Lord of Knowledge), Nartana Ganapati (the Dancing Lord), Bala Ganapati, (the Young Lord), Ekadanta (single tusked), Maha Ganapati (the Supreme Lord) Omkara (One who has the form of 'OM") and so on. When a Puja is performed, it starts with an invocation on Lord Ganesa. When a musical consort is on, it starts with an invocation prayer to Lord Ganesa. Similarly, whatever be the temple, that of Siva or Vishnu, one would find a shrine for Ganapati there. Lord Ganapati is all prevalent. Whether one starts a business venture or whether one starts a learning process, the first thing he does is to worship Lord Ganesha. Young students chant the name of Ganesa before entering the examination halls. So, Ganesa exercise overwhelming influence in the life of all. It is believed that the large head of Ganesa shows his intellectual power, his big ears shows his receptivity and his trunk shows his adaptability. He has four hands. He holds the weapon of Ankush in one hand which symbolizes the power to control evils which the mind symbolises. In another hand he holds the axe which severs all bondages and attachments. The third hand holds the sweet delicacy of Modakam. The outside layer of modam denotes our body while the inside content called Poornam denotes Atman. You may recall the lines from Isavasyopanisad: “Poornamadha Poornamidham Poornadh Poornamudichyathe, Poornasya Poorna Maadhaya Poornameva Avasishyathe”. (That Supreme Brahma is Omni perfect in every way. This universe also is perfect on account of that Supreme brahma as the Universe has emanated from the Brahman itself. This way the perfection of the universe results from the perfection of Brahman. If out of that perfect Brahman this perfect universe is minussed, yet what remains is still the perfect Brahman). The fourth hand bestows Ganesa’s blessings to all. There is an interesting story of how Ganesha acquired his elephant face. According to mythology, on one occasion when Lord Shiva was not present, Parvati created a living being out of clay. She named him Ganesa, blessed him with extra-ordinary power and assigned him the role as her protector. Before she went for bath, she had asked Ganesa to stand as guard at the entrance. At that time, Lord Shiva had returned home. Not knowing the identity of Shiva, Ganesa prevented his entry into the premises. Furious by this act of a stranger, Lord Siva struck off the boy's head. When Parvati came to know about this, she felt great grief and explained the origin and identity of Ganapati. Lord Shiva then deputed his men to go out and bring the head of any being who appeared on their path. Since an elephant was passing through, Siva's men severed the head of the elephant and brought it to Lord Shiva. Lord Shiva then placed the elephant head on the neck of the boy. Lord Siva then gave his blessings to the boy and appointed him as leader of his troops. The boy thus got the name, Ganapati; 'Gana' means the followers of Lord Siva and 'Pati' means the leader. Lord Siva then declared that whoever worships Lord Ganapati before starting any venture would overcome all obstacles and attain success in their specific field of activity. Though there are many exclusive temples in India for Ganesha, the Sidhivinayaka temple at Dadar, Mumbai is very famous. It is believed that devotees who come here seeking the blessings of Ganapati attain ever-lasting happiness and prosperity. When Ganesh Chathurti comes, the whole Mumbai reverberates with the slogan "Ganapati Pappa Moriya". The Uchi Pillayar temple at Trichy is also well known pilgrim centre in South India. Maha Ganapati has another identification which most of us may not be aware. He was the first Stenographer. While Veda Vyasa composed his immortal work, Mahabharata, he requisitioned the services of Ganpati to transcript them. If Ganpati had not taken the notes and transcribed them truthfully, perhaps, we would not have been blessed with an epic (Maha Kavya) like Mahabharata. We go to Vinayaka with many offerings. Ofcourse, he accepts all the offerings that you give with devotion. But there is one offering that he loves most. It is not the coconut. It is not the Modakam. It is not the sweet delicacies. It is not the cash. It is YOU. He wants YOU to surrender before him. Surrender means not giving yourself but giving up your desire, your anger, your passion, your emotion and last but not the least, your ego.